We are reckoned as the most prominent Blood Transfusion Set Exporters from India. Various leading industries are widely placing orders for the Disposable Blood Transfusion Set as these are of unmatched quality and possess unbeatable performance. 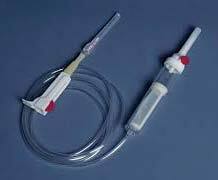 The blood administration set is also available in single as well as double chamber, needle size 18 X 1 with drop size of 20 drops/ml. The Blood Transfusion Set is widely demanded in the national as well as international market due to the simple designing and effective functioning in the respective application. Smooth kink resistant Non toxic PVC tubing with very efficient shape roller controller for accurate & unrestricted flow.